FILE - President Donald Trump announces a deal to temporarily reopen the government, in the Rose Garden of the White House, Jan. 25, 2019, in Washington. The Pentagon is sending an additional 3,500 troops to the U.S. southern border with Mexico to assist with border security measures. 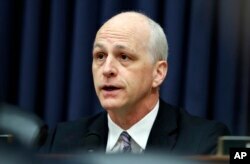 Representative Adam Smith (D-WA), the chairman of the House Armed Services Committee, released the latest troop numbers after slamming the Department of Defense’s lack of transparency in a letter to Acting Secretary of Defense Patrick Shanahan. Armed Services Committee ranking member Rep. Adam Smith, D-Wash., speaks during a hearing on the FY2019 budget, April 12, 2018, in Washington. A defense official confirmed that the Pentagon was sending 3,500 additional active duty troops to the border, for a total of 5,800 active duty troops and 2,300 National Guard troops supporting the Department of Homeland Security’s request for additional border security. The official, who spoke to VOA on the condition of anonymity, added that this “initial pop” in the number of troops would not be sustained through September. Some of these 3,500 will be replacing troops who will be leaving soon, while others are only assigned to the border for 30 or 60 days in order to set up large coiled barbed wire in specific areas, according to the official. The latest change comes as U.S. President Donald Trump and House Speaker Nancy Pelosi clashed again Thursday over Trump's demand for taxpayer funding for a wall along the southern border with Mexico. Speaker of the House Nancy Pelosi talks to reporters during a news conference at the Capitol in Washington, Jan. 31, 2019. Trump declared on Twitter that the wall would get "done one way or the other." 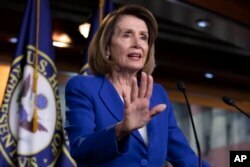 But Pelosi, the leader of the Democratic-controlled House of Representatives, told reporters, "There's not going to be any wall money" in border security legislation a bipartisan congressional panel is negotiating to keep the government from another partial shutdown when current funding expires Feb. 15. Pelosi said she was open to other kinds of barriers along the border, but Trump said that was unacceptable. "If there's no wall, it doesn't work," he said at the White House. The U.S. leader, in a string of tweets on the barrier, said the wall would be built even if lawmakers don't give him the money to construct it. He is considering declaring a national emergency to build the wall without congressional authorization by tapping other unused government funds, a move that would invite an immediate legal challenge from Democrats. Trump contended that Republicans on the congressional committee considering funding for border security "are wasting their time" because opposition Democrats "despite all of the evidence, proof and Caravans coming, are not going to give money to build the DESPERATELY needed WALL." But he told Republicans not to worry: "I've got you covered." Without giving any details, Trump said, "More troops being sent to the Southern Border. ... With a Wall it would be soooo much easier and less expensive." The border security panel opened talks Wednesday over Trump's demand for $5.7 billion in funding for a wall in a dispute that led to the longest-ever 35-day partial government shutdown that ended last week. A Trump agreement with Congress to reopen the government until Feb. 15 gives lawmakers about two more weeks to reach agreement on border security funding. Democrats appear willing to agree to Trump's demand for the $5.7 billion in border security funding, such as for tightened controls at ports of entry and increased use of technology to monitor the border. But as the talks started, Democrats offered no money for Trump's wall. Trump, as he often has, claimed erroneously that "Large sections of WALL have already been built with much more either under construction or ready to go." The U.S. has been repairing existing barriers, which Trump called "a very big part of the plan." Trump has threatened a new government shutdown if Congress does not give him the wall funding he wants, and has said he might declare a national emergency to build the wall. 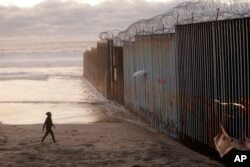 FILE - A woman walks on the beach, Jan. 9, 2019, next to the border wall topped with razor wire in Tijuana, Mexico. At various times, Trump has called the barriers at the border an impenetrable concrete wall, and other times "steel slats," or a see-through barrier, even "peaches," if people preferred. But on Thursday, Trump said, "A WALL is a WALL!" He claimed that Mexico's soaring murder rate was reason enough to build the wall. He said that with the record Mexican murder rate, "why wouldn’t any sane person want to build a Wall!"